Like cracked recitations of knots and small puffs of air it snuggles along the new album from Mark Solborg. The improvisations of five musicians – the presence of five human beings, create an organic body of sound. With this album guitarist and facilitator, Mark Solborg, lifts himself up in the tallest of trees. He has found allies in the English veteran of avant-garde, sax-player Even Parker, and American trumpet-player, Herb Robertson. In the trio bass player, Mats Eilertsen, and drummer, Peter Bruun, are the perfect partners in a project which demands something extra ordinary from its musicians. It’s quiet music which weaves in and out. Volume rises and then suddenly we’re somewhere else. Solborg himself talks about this project as an absolute highlight in his work with improvised music. I won’t hesitate in calling it a highlight in the history of Danish improvised jazz. 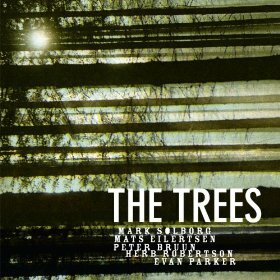 The Trees is the finest of all 12 albums which Solborg has recorded. It is music with its very own spirit – it becomes a living body in which wonder and joy keeps on flowing. My soul, how can you ask for more? Review: Niels Overgård. Translation: DSI Swinging Europe.